In terms of County Mayo Protestantism, one of the most interesting stories is that of Edward Nangle and the Achill Mission. In the early 1800’s the West of Ireland was regarded in Protestant evangelical circles as the frontline in a war against Catholicism, and as a direct consequence several schemes to establish missionary settlements were implemented. These included Dingle in County Kerry and Lough Corrib in County Galway, however the most prominent was that at Dugort on Achill Island. Nangle came from a line of prominent Meath Roman Catholics, but his Catholic fathers second marriage to a Protestant wife and her subsequent death saw him educated in the Protestant Cavan Royal School and Trinity College Dublin. A calling to the church saw him ordained in the Church of Ireland, and his clerical journey eventually took him to Achill Island in 1931 aged 32. 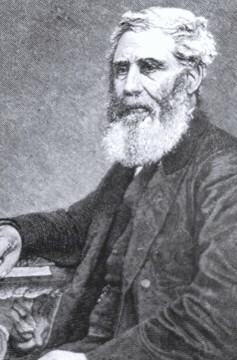 His next 20 years on the island working for the Achill Mission saw him establish and build a colony at Dugort, open four schools, a post office, printing press and build the islands first hotel. The island with a Protestant population numbering just a handful in the early 1830’s, eventually included a Protestant settlement at Dugort alone well in excess of 400, with the majority being Catholic converts. Where no Church of Ireland had existed,within Nangle’s time on the island would see three Churches built at Dugort, Achill Sound and Innishbiggle; whilst a Parish of Achill would consist of five Churches. Nangle’s work was unsuprisingly filled continually with controversy, with a mixture of souperism accusations (semi-forced conversions to Protestantism through ‘bribery’ via food and other comforts), self agrandisment accusations, and simply being an ‘evangelical fanatic’. Nangle’s ‘success’ led the Catholic Archbishop of Tuam McHale to place substantial extra resources via way of both Priests and money onto the island in an attempt to combat the achievements. Not all ofCatholicsim was critical of his work though, with North Mayo priest John Lyons saying that he ‘is doing a great deal of good for the poor people of Achill’. Nangle’s leaving to a new church in Sligo and rising emmigration level’s, would eventually lead to the decline of the colony. Today just one church with a small congregation remains active, St Thomas’s at Dugort, and extensive repairs are currently needed to keep it functioning. If you feel you can help the St Thomas’ Church Repair fund please contact Church Treasurer Tim Stevenson at 003539843110.